When in Naxos we have more figs than we can handle. Just two fig trees produce such quantities than we do not even have to stretch more than where our arms reach to collect whole baskets. We feel somehow obliged not to waste such glorious fruits and we try to come up with new ways to prepare and preserve them. Two years ago we decided to use them for chutney. I do not remember with how many kilos of dubious fig chutney we ended up. This year we continued to explore. We wanted to combine with other local ingredients. Potatoes, fish and protocyladic art were opted out… but honey and xinotyri – the local variety of goat cheese – were a hit! We adapted the following salad from Ottolenghi’s ‘The Cookbook’. Whisk the honey and olive oil and add salt and pepper to taste. 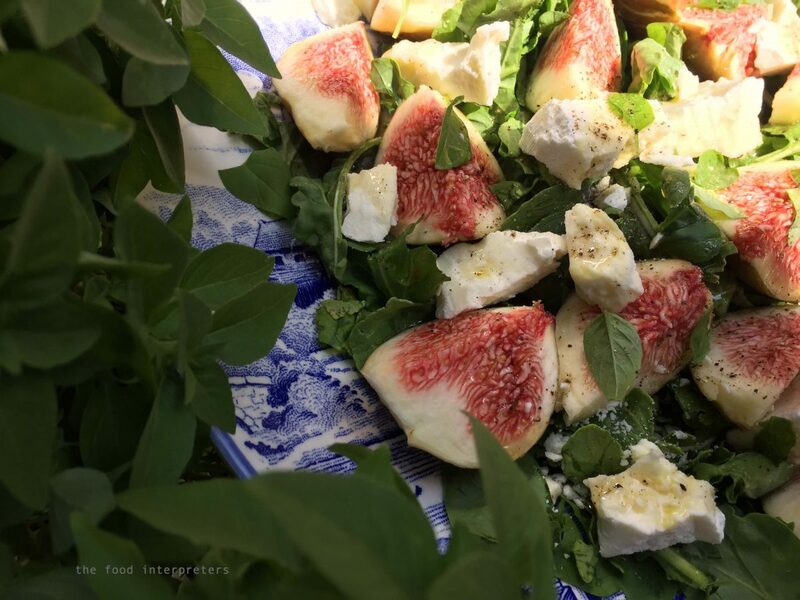 Arrange the rocket, basil leaves, fig quarters and pecorino on a large plate or shallow salad bowl. Drizzle over the dressing and some more black pepper.